Wifi development board programmable with Arduino IDE using USB connector! Choose to add the BME280 and VEML sensors for just $10 more! 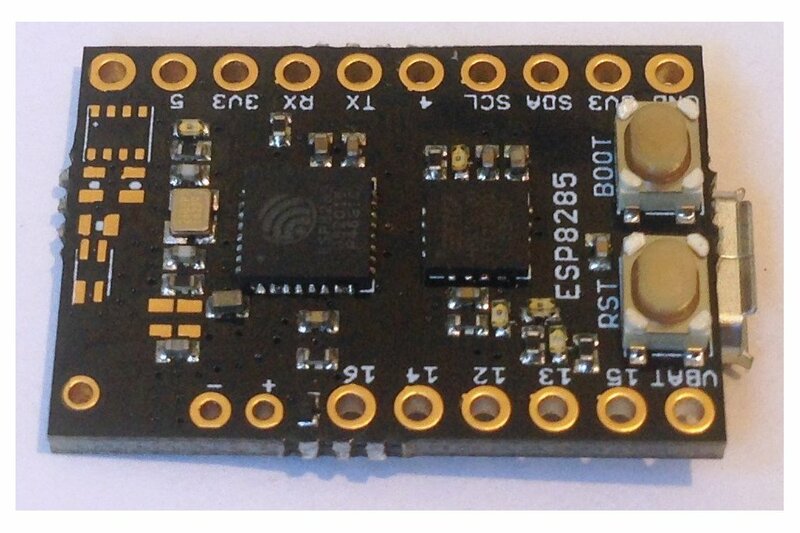 Check out Marcel Stoer's review of using NodeMCU on the ESP8285 Development Board! Want to program the ESP8285 Development Board in Python? This is a small (0.7 in. x 1 in.) development board for the ESP8285 (ESP8266 plus 1 Mbyte embedded SPI flash memory) which includes an FTDI FT230X USB-to-serial converter so Arduino programs can be flashed via the USB Micro-B connector. The board has a MAX1555 LiPo battery charger, a 3.3 V MIC5528 LDO supplying 500 mA for plenty of power, has reset and boot buttons for easy programming, has a blue led on GPIO15, green led for power on, red led for charging indication, and yellow and orange leds for RX/TX. The board exposes all eleven of the GPIOs including GPIOs 0 and 2 (SDA/Boot mode enable and SCL), GPIOs 1 and 3 (UART RX/TX), GPIO 15 (pulled to GND by a 4K7 resistor and with a blue led indicator), GPIO16 (connected to #RST via a 0 Ohm resistor for wake from deep sleep) and GPIOs 4, 5, 12, 13, 14 as general IOs. The LiPo battery anode is connected to the ESP8285 ADC via a 1 MOhm/300 kOhm voltage divider so it will read 1 V (Vmax for the ESP8266 ADC) when the single-cell LiPo battery is fully charged at 4.2 V. In addition, there are two 3V3/GND ports, and a VBAT port at the edges of the board so additional sensors, motor drivers or whatnot can be added and managed by the ESP8285. I have added the footprints for a Bosch BME280 pressure, temperature and humidity sensor as well as Vishay's VEML6040 RGBW ambient light sensor (or VEML 6075 UVA/B sensor which has the same footprint). Adding these sensors turns the board into an environmental monitor with sensor values streaming to a web page via wifi. 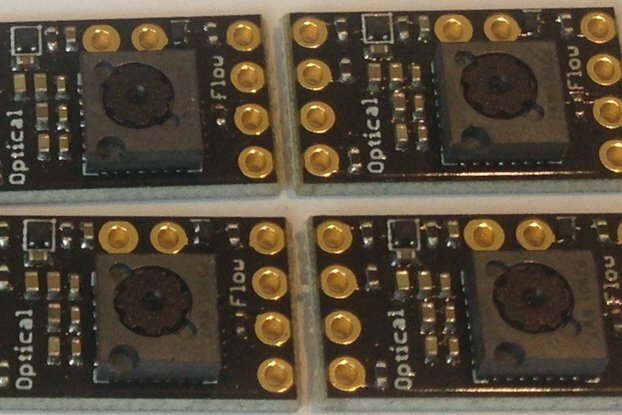 By default these sensors are NOT on the board so please specify if you want them for an extra $10. When the USB cable is plugged in the board can be programmed just like a Teensy over the USB cable using the Arduino IDE. Furthermore, the FTDI allows serial output to the Arduino IDE serial monitor. The intent is to use the USB for program development and then transition to the LiPo battery to test applications. Without the USB cable connected the board operates from a single-cell LiPo battery or 5 V DC power supply (VIN < 5.5 V) and the FTDI chip is not powered. 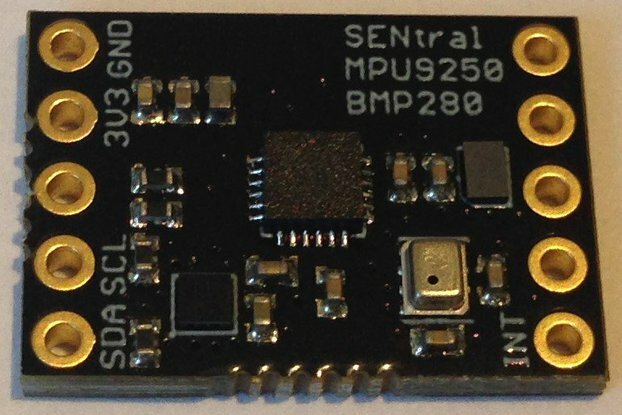 In this case, serial is still available from the RX/TX port on the edge of the board, although it is more likely serial input from some add-on (like a GPS module) would be attached here. In fact, the top right six edge pins match the pins of a typical FTDI external connector in case, for some reason, you would prefer to use this. The SPI embedded flash for some reason requires using the DOUT or QOUT flash mode instead of the usual DIO or QIO modes. If these are not options in your IDE version you have to go into the boards.txt file and add them. Future releases of the Arduino IDE for ESP8266 will include these as defaults too. Lastly, I have put a through-hole at the end of the antenna trace where a 1.25 inch long copper wire needs to be soldered for "good enough" wifi transmission/reception. With this method I have no trouble receiving signals from ESP8266 devices placed around the house from anywhere inside the house. 5) it should start after successful flashing but you might have to press reset to get it going. Still having problems? Send me an email at tleracorp@gmail.com. Why did you make it? 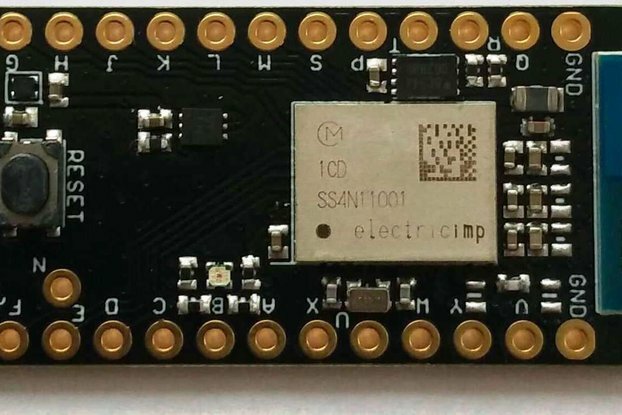 I like the ESP8266 and the ESP8285 with its embedded 1 Mbyte of QSPI flash makes designing very small devices with wifi connectivity even easier. 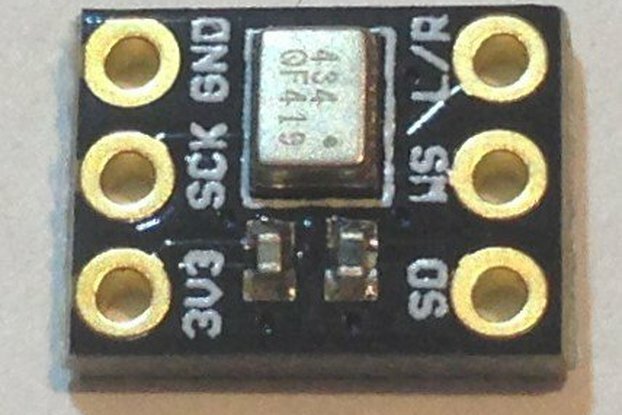 I got tired of using an external FTDI connector to program my ESP8285 breakout boards and I wanted a more generally useful way to develop ESP8266-based applications. I tried OTA programming but half the time it didn't work for me (poor wifi service?). What better way than to make the ESP8266 programmable via a USB connector? With this development board I can do all of my application development conveniently on a breadboard. I can charge a LiPo battery while I develop and improve my application code, I can enter boot mode or reset easily with the on-board buttons, I have access to all of the GPIOs so I can connect sensor breakout boards or an SD card or whatever I want. 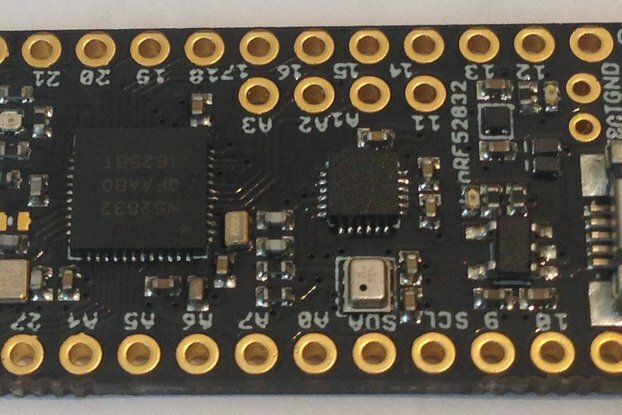 The small size of the ESP8285 Development Board leaves plenty of room on the breadboard for other devices. 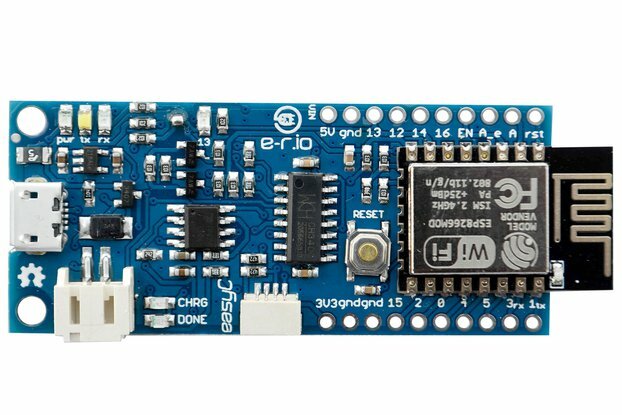 Basically, this integrated development board makes using the ESP8266 easy and convenient! I made the board small, breadboard friendly, and as useful as I could for application development. In fact, the entire development board is only slightly larger than the ESP-WROOM-02 module! 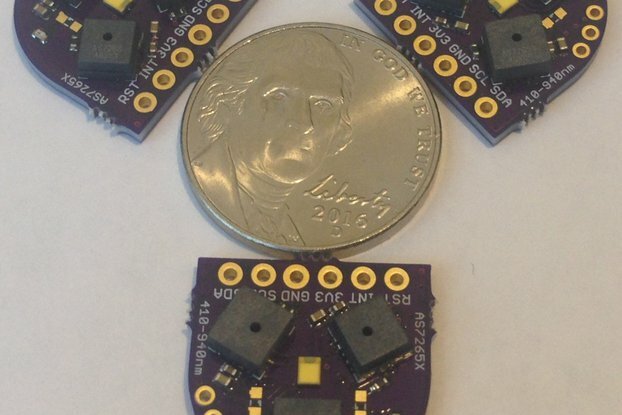 And because it is small, it can also be used for prototyping wearable and IoT applications. It is breadboard friendly but can be made into a portable, battery-powered device for solving real world problems. I use them around the house to report on environmental conditions. The only downside to wifi is that it is power hungry, so the user has to develop strategies to extend the life of devices running from small batteries. There is a deep sleep mode which can be helpful in this regard. I am still trying to optimize utility versus power in my own applications, but this development board makes it easy to do the work! With light sleep mode enabled the average current consumption drops from ~20 mA with modem sleep (default) to around 10 mA at a five second wifi broadcast period. 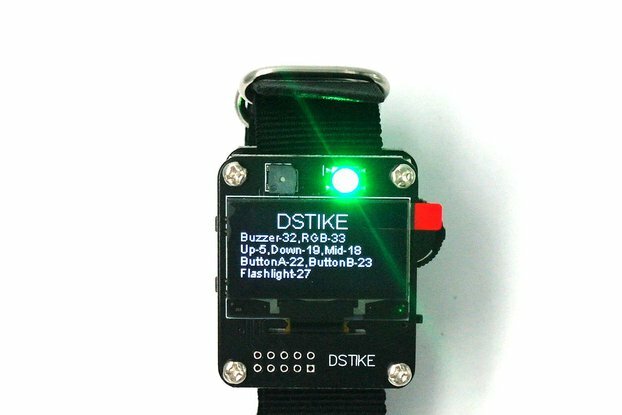 This is small enough that the device can continuously broadcast for more than 24 hours on a small 300 mAH LiPo battery. The current draw is large enough that the temperature reading of the BME280 will typically be a few degrees above the actual ambient air temperature. There is no limit to what you could do with this capable MCU with embedded wifi now in a super easy to use, small and portable package. Yes, it's expensive. But just consider: the ESP8285 Development Board has everything you need not just to develop your IoT application but to prototype it in the field (or on the person) as well. 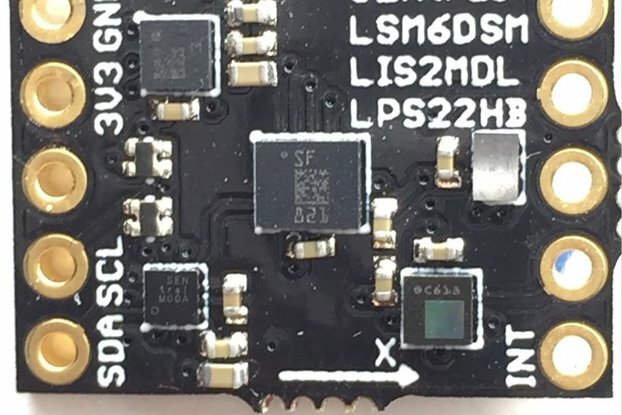 It is small and portable, with a built in charger and an LDO with enough current capacity to power the wifi plus whatever else you add onto the board. It is a complete solution! If you just want to get your hands on an ESP8266 module and don't care how much soldering, wire and breadboard space you'll need to make it work don't buy this development board, you'll be paying too much! But if you want a complete solution to IoT development prototyping, this is the board for you! 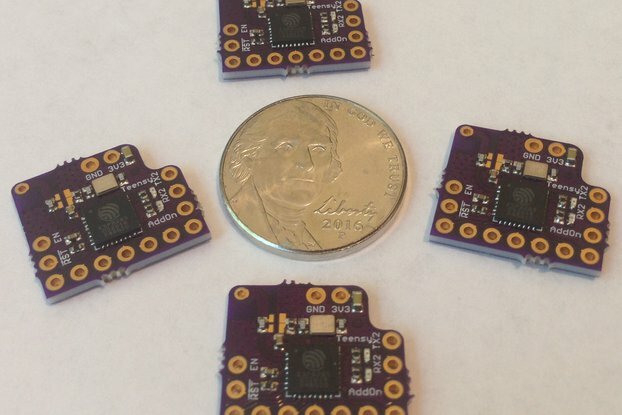 Order the pcbs from OSH Park and assemble some of your own, or buy the assembled and tested development boards from me and see how easy it is to develop wifi applications on the ESP8266! Priority mail for faster delivery only available withing the US. I'm very happy with this little board : small, efficient, very easy to use. I would like to use it to make small and very low power environemental sensors, powered by small solar cells. I have made a modified version of your script (with post to PHANT instead of a server) and have been able to have less than 8mA of current used during sleep, which is very good for my usage. If I can ask for one improvement for the hypothetic next revision : the BME280 sensor seems to be impacted by the rest of the board (interference or just heat dissipasion of the other component, not sure yet). As you said, a small offset can be set in the code, but since the BME280 use internal temp to compensate for humidity and pression, seems that everything is a little off and it doesn't seems to be linear. Would it be possible to add a little gab between this sensor and the others component (or a heat shield ?!) ? I would be very happy to buy more than one of a new revision with this very little issue solved ! Thanks a lot for this very good little board ! 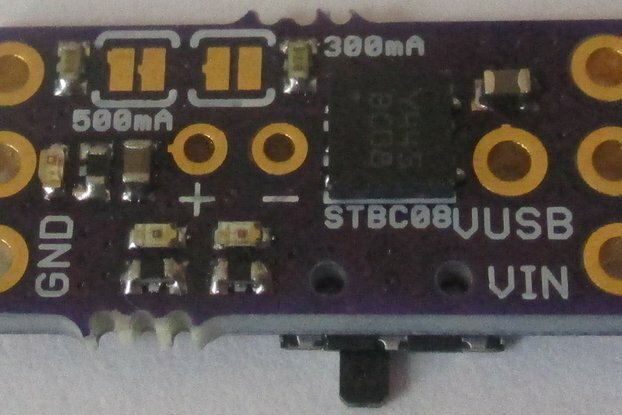 The VBAT pin on the lower left corner is a VIN pin and can accept any voltage from 3.3 to 5.5 V. If you have a LiPo battery connected to the board via the +/- port then VBAT will show the LiPo battery voltage; VBAT is connected to the + port. However, if you do not use a LiPo battery on the +/- port, then VBAT is a VIN and the board will be powered by either VIN or VUSB, whichever is the greatest voltage. I got in touch with Kris initially inquiring about his dev board after some research into esp8266. This board is unique and the way Kris has designed it makes it the easiest to develop code out of all the offerings out there. Kris answered every question I had very quickly without any bias towards the products he is selling. I'm definitely getting more stuff from his store in the future! I am working on a revision of the board that exposes two more of the GPIOs (pins 9 and 10) for an even better utility. I am impressed by how much thought went into the design of this, and I love the “appallingly small” size. I am using it with MicroPython (just playing around for now, no specific project) and everything I’ve tried works flawlessly. I did get tracking even with the cheaper shipping option, despite the description saying otherwise, and the shipment arrived in Switzerland in 9 days. Thanks for the kind words! I like purple too, but this is not an option at the fab I usually use and i got tired of assembling these myself! Have been playing around with MicroPython and Blynk (using Arduino) on this . Great little board! I haven't figured out what I'm going to use it for long term yet, but it's great to have the very small option. Maybe for a wearable (I'm not really into that but I'm trying to encourage my 14 year old daughter to learn as much as she can about programming and microcontrollers so maybe a wearable project will induce some extra learning opportunity for her).